Wouldn't it be nice if there were a way of exercising that took less time while getting you the results you want? Well, that's interval training! Picture a southwestern guy about 6 foot 1 inch, with an average build. Now picture him with black slacks, a big belt buckle, and bolo tie around the neck of a very colorful striped button up dress shirt. You are now picturing Dr. Len Kravitz, a famed researcher and professor. This guy knows his stuff and is VERY enthusiastic about it. I went to an IDEA Fit seminar in Alexandria, Virginia where I had the privilege of seeing Dr. Kravitz pace up and down the isles, through the audience as he began oozing excitement about their findings in a new study. What did they study? Interval training! 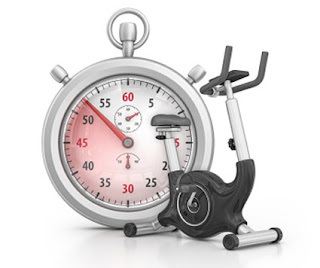 So what's the "gist" of interval training? Basically, instead of working up to a level you can maintain for a long period of time, say 20 minutes to 1 hour or more, you perform bursts of more intense activity mixed with less active rest periods. A common comparison is a marathon runner verses a sprinter. A marathon runner gets in a zone and just keeps running at a steady pace. 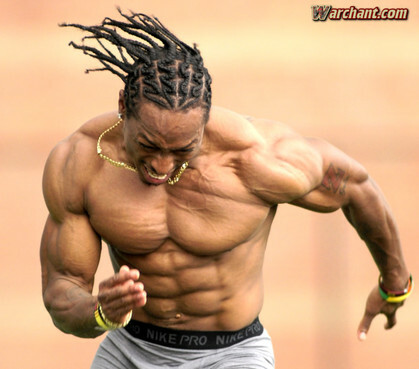 A sprinter will... sprint a set distance then slow down and rest. Now both marathon runners and sprinters have very low body fat percentages but one takes a lot more time. 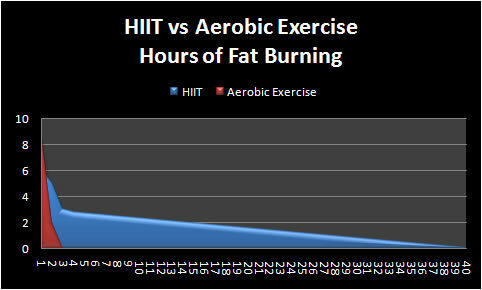 With interval training you do bursts of high activity ("high" is relative to YOUR ability). In these bursts you burn more energy than if you were going at a steady pace. As these bursts add up over the course of a workout, you end up burning more calories in the same amount of time as a steady pace workout. Another way of looking at it is that you can burn the same amount of calories in less time. Isn't that GREAT news? You don't have to be in the gym for hours on end! But there's more! After a workout you continue to burn calories due to what is called "EPOC" or excessive post-exercise oxygen consumption. During a workout your cells are being challenged. They are being thrown out of there "happy" state of homeostasis. Don't worry this is a GOOD thing because it triggers adaptation - the cells get better at recovering and maintaining homeostasis. Now in order to return to a state of homeostasis, work must be done. Anytime work is done, calories are burned! EPOC = more calories burn when you are done working out and going on with your day! So how does this relate to interval training? Well, study after study after study show that EPOC is higher after interval training than it is after a steady pace workout. It makes sense. More energy is required from the cells for interval training, which means the cells' homeostasis is further disrupted, which leads to more work needing to be done to recover. Did you catch that? Go ahead, re-read it and think it over if you need. As you can see in the chart from intervaltraining.net, you only burn extra energy for about 2 - 3 hours post-exercise with steady pace cardio where as with interval training, also known as high intensity interval training (HIIT), you can keep burning calories up to 38 hours post-exercise! Basically, cardio triggers adaptations that allow your heart to work more efficiently. Your resting heart rate drops and you can handle much more activity with greater ease. Now some studies show that interval training gets these same, and even superior, results in less time! That's AWESOME! When we do cardiovascular exercise, we tell our bodies, "Hey you! We're going to be doing this every week so you better get use to it!" To which our bodies reply, "if I have to...." So it does. It multiplies the number of mitochondria we have in our cells. Mitochondria are the "power houses" or "power plants" of the cells. The more you have and the more efficient they are, the more ENERGY you have! Now, both steady pace workouts and interval workouts trigger this to happen but interval training gets the job done in less time! Are you starting to see a theme here? But doesn't steady state cardio burn a higher percentage of body fat? Yes. Steady state or steady pace cardio has been shown to use more fat for energy verses using carbs for energy. However, in weight loss, the calorie deficit is king, right? We learned that in "What's the Key to Losing Weight?" So if the calorie deficit is king and interval training burns more calories than wouldn't we want to do interval training? In a crazy busy world, wouldn't we do more interval training because it takes less time which means more time with family and friends and getting work done? Steady cardio does have its place as we will learn more in "Interval Training Explained - Part 2." So if you are a bodybuilder looking to save as much muscle as possible while burning fat, yes do more steady cardio and have 1 interval workout per week. If you are overweight or obese, focus on interval training with some steady cardio on the side. Interval training has many more benefits that you can learn about here. How to Peel an Egg the EASY Way!